DataBank Ltd. was founded in 2005 in the beautiful historic former Federal Reserve Bank Building in downtown Dallas, Texas. As a federal depository built to withstand any event, the building had excellent bones to become a data center. The 96 year-old landmark building was converted into a data center during the height of the dot.com boom in 1999. Other than architecture, the founders were cognizant of the market’s growing need for a more personalized colocation solution. In July 2016, DataBank was acquired by a group of leading blue-chip investors led by Digital Bridge, and the DataBank team merged C7 Data Centers, two assets from 365 Datacenters and Edge Hosting into the fold. The Company also completed several data center build-outs, and made a series of executive appointments, including the hire of current CEO Raul Martynek. 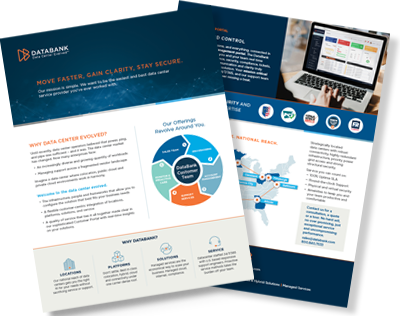 Over the past 18 months, DataBank has expanded its footprint from six data centers in three markets to 15 data centers in eight markets, while also significantly boosting its product capabilities in managed services, security, and compliance.